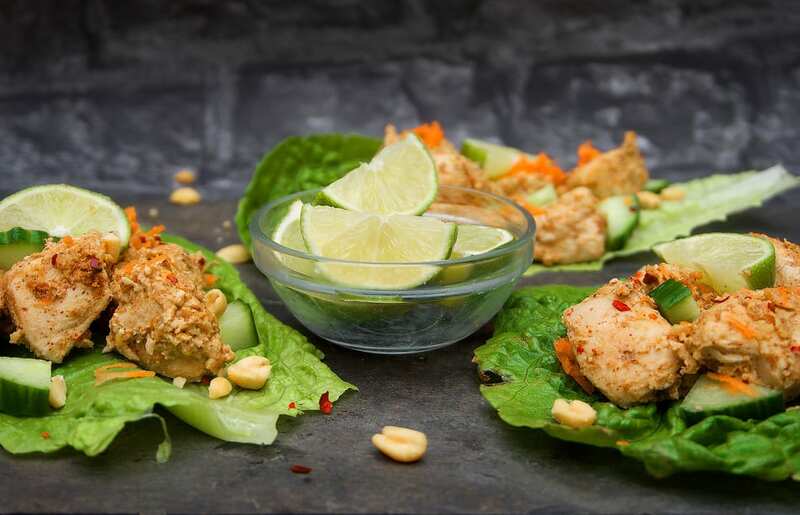 If you’re feeling a little blue for some weekday meal inspiration then look no further than my delicious bang bang chicken recipe. 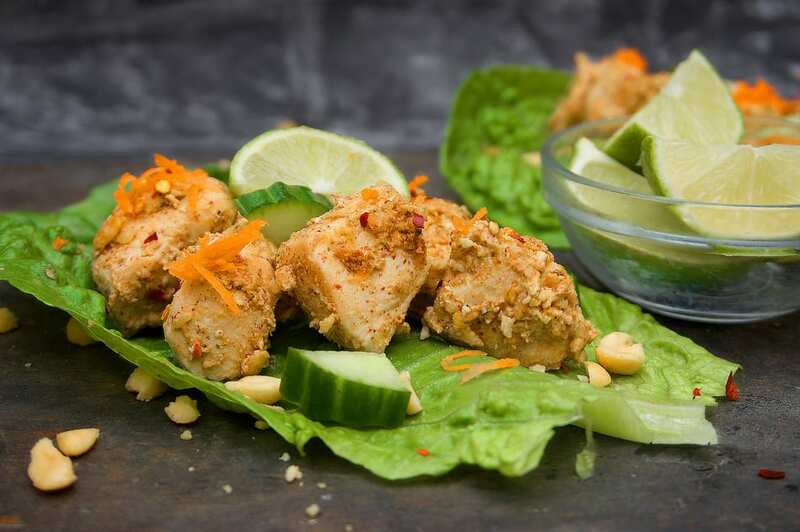 It’s simple, it’s mouth watering delicious and it’s full of healthy fats and essential protein. The chicken itself is actually coated with peanut butter (all natural) and is mixed with lime, a little hint of chilli and whole milk. It may sound like an unusual combination but trust me, this dish is packed full of flavouring that will leave you wanting for more. Now you may not know this, but peanuts are in fact not a nut. Are they good for us though? Yes. They are full of monounsaturated fat, the really good fat, and in-fact the average peanut is roughly 50% fat – the same healthy fat that you find in olives, oleic acid. When it comes to antioxidant content, peanuts are on a par with the Superfood berries and are a richer antioxidant than most other fruits. Harvard Medical School recently wrote that, “Peanuts linked to same heart, longevity benefits as more pricey nuts”. They actually have one amazing antioxidant you wont find in other nuts –resveratrol. It’s an antioxidant found in red wine and believed to help prevent both heart disease and certain cancers. Whilst peanuts are healthy, just make sure you don’t eat too many. Over one peanut has 6 calories so beware when you’re out socialising and scooping up a handful of peanuts every 10 minutes! I’ve topped my bang bang chicken with an added sprinkle of peanuts but this is optional. Other than that, the peanut butter coating does all the talking for this recipe. 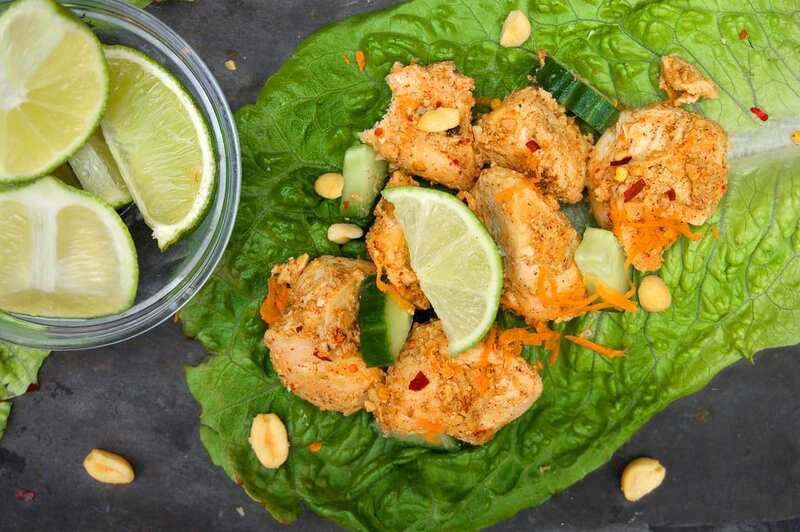 Pair it with some simple lettuce wraps and you’ve got yourself a primal friendly dish that is perfect for the whole family! A delicious primal/paleo friendly weekday dish. Full of healthy fats and protein to keep your energy levels up and of course, to keep you satisfied! Begin by heating a pan with 1 tsp coconut oil. Once your pan is hot, add the diced chicken breast and cook until done. In a bowl, add the peanut butter, milk, lime, chilli flakes and soy sauce/coconut amigos and mix well. Once mixed, add your cooked chicken and stir until the sauce is covering the chicken completely. 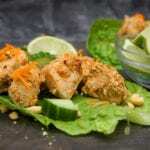 Add your chicken to the lettuce wraps and top with cucumber, sliced carrots and extra lime wedges (optional).